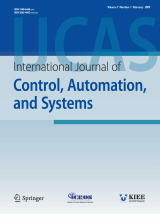 Abstract : "This article describes a novel robust hybrid control of a 7-DoF upper limb exoskeleton robot. Insensivity can be taken into consideration as the important feature of sliding mode controllers, which is merely valid in the sliding phase. In order to improve controller performance by eliminating or minimizing the time to reach the sliding phase, a sliding surface design can be designed appropriately. In this study, a new sliding mode controller is designed to achieve high performance, which is robust against external disturbances. PID controllers have been widely used in robotic systems since high trajectory can be one of the most important advantages of this controller. Therefore, by combining a new sliding mode controller and a conventional PID controller, a novel hybrid controller is proposed which has excellent performance. Simulation results demonstrate the effectiveness of the proposed control method." Keyword : Hybrid control method, PID controller, sliding mode controller, upper limb exoskeleton robot.